In 1988, the Trondhjem Lutheran Congregation moved out of this historic building into a new church a half mile away. A new organization was formed to preserve and care for this old church. Membership in the new group came from interested people in the community and descendants of former church members across Minnesota and many other states. At that time, the roof had several leaks, the interior plaster walls were covered with layers of wall paper and composition board paneling, and the plaster ceiling had one layer of embossed tin which was covered by another layer of acoustical dropped ceiling. These so-called “improvements” had been added over the life of the building and hid the original beautiful décor. All memory of what was hidden under those layers had died with the early pioneers. The first major restoration project was restoring the roof to its original cedar shingles and thereby stop the leaks. It took ten years of saving small and large contributions and holding fund-raisers to finally have enough funds in 1998 to accomplish the re-roofing project. In doing so, we duplicated the decorative scalloped design of shingles as they appeared in old photographs of the church. In 2000 we renewed the exterior siding and the windows, following the guidance of the Minnesota historical architect, Charlie Nelson. The most exciting surprises came in 2001 as we began to remove the deteriorating wall and ceiling coverings. Beneath the layers we found well preserved and very tasteful interior painting with traditional Norwegian designs and colors. Fortunately, rather than painting the walls and ceiling thereby destroying this work, the people had used materials that covered them without destroying the original. This finding prompted us to engage Dan Tarnoveanu, art restorationist, to research the paint designs, colors and materials and plan a professional restoration. 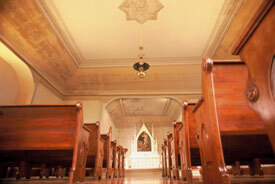 He described the building as among “the most harmoniously built and decorated churches in Minnesota. The paint that was used was tempera – dry pigment mixed with hide glue, a material commonly used at the end of the 19th century. In 2001 and 2002 the plaster was repaired and Dan Tarnoveanu, with one assistant, proceeded to restore the interior décor. Over a period of 6 months the beauty of the original church was restored to its full glory, just as it appeared more than one hundred years ago. In 2002, TCPS was honored with an award from the Minnesota Preservation Alliance for excellence in saving and restoring a Minnesota treasure.